The Sacred City of Kandy is situated on a plain, in the middle of what is called the Hill Country. Tea plantations and cool hill stations surround it. Kandys existence dates from the 14th century. Until 1815 it even was the capital of the country, then called Ceylon. 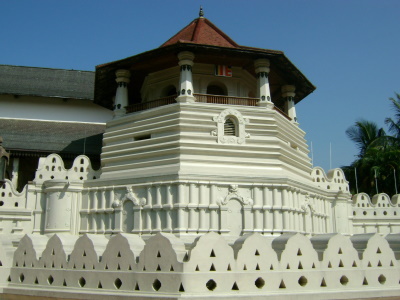 Nowadays Kandy is most famous for the presence of the Temple of the Tooth. According to tradition, a tooth of Buddha is kept here. The tooth is said to be saved from his funeral pyre, in the 6th century BC. It was then brought to Sri Lanka and guarded there for centuries. A story goes that the original tooth was shipped to Goa by the Portuguese in the 16th century, and that the one kept in the Temple of the Tooth is a replica. 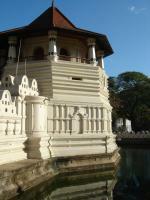 All in all, Kandy is a very popular and busy pilgrimage site for Asian Buddhists. Kandy is a green city with 100.000 inhabitants. It is dominated by a large, central lake. Compared to the capital Colombo a stay here is a relief. There are several shrines to visit, and it is also a good place for walking tours. The Temple of the Tooth of course is the major sight. Watching the pilgrims even more ... each day the room where the tooth is saved is opened up to let the numerous visitors catch a glimpse. 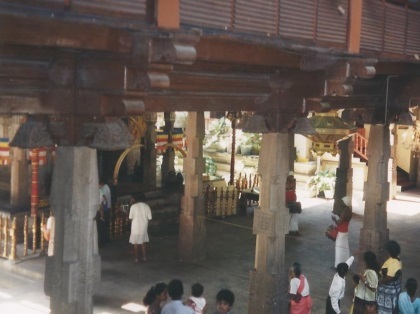 The highlight of Kandy is the Temple of the Tooth and I spent most of my time there. What I found most interesting was all the people there. Every generation within a family comes along together and spends time in the temple - often just sitting on the floor and hanging out together. 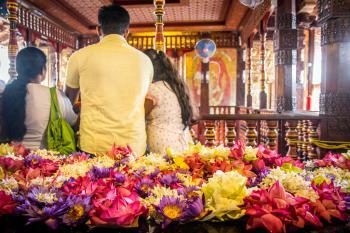 It's a lovely portrait of the people in Sri Lanka and their relationship with their religious buildings. Kandy is a really easy city to get to and it has good train connections with other parts of Sri Lanka and it's a pleasant way to get in and out of the city. Kandy is a lovely city, but I'm not convinced that it is WHS material really. The Temple of the Tooth is interesting but is marred by some rather nasty political nonsence in one of the exhibition rooms. Still, the city is a nice place to hang out for a few days before seeing the more interesting WHSs nearby. I was in Kandy for one year stint as an expatriate in year 1998. Kandy is a small, serene and hilly city with a big man-made lake in the center. Its climate is perfectly nice for me. Ooops..Tamil Tiger suicide bombers bombed the temple of the tooth few days before I arrived at the city. Kandy is like Mecca to Muslim, a holy city visited by many Buddhist worshippers especially on 1st and 15th day of the lunar calendar. The rooftop of the temple is coated with the gold sheet. The annual grand parade or processing in somewhere June or July is an unforgettable event, not found in other part of this world. Singhalese dancers in traditional gears performing traditional dance and music in acrobatic movement to entertain bystanders and a platoon of elephants carrying Buddha tooth is truly eye-opening experience. This grand processing usually last for three long weeks! Wesak day is a big celebration day to Singhalese people. Almost every house is decorated with lantern made from the bamboo and white paper. Kandy botanical garden is a beautiful and magnificent tropical garden. Watch out for the countless of fruit bats hanging upside down on the treetop. Bad thing is foreigners need to pay 10 times more entrance fee than local folks. Bull carts and elephants are still a mode of transport to some local people. Don't be panic when you see elephant is blocking your four wheels car. Lastly, I hope my friends in Sri Lanka can email me and keep in touch. Undergoing Restoration or Repair: Queen's Bath House in Kandy (located in the lake close to the Temple of the Tooth) was covered with scaffoldings in November 2015.